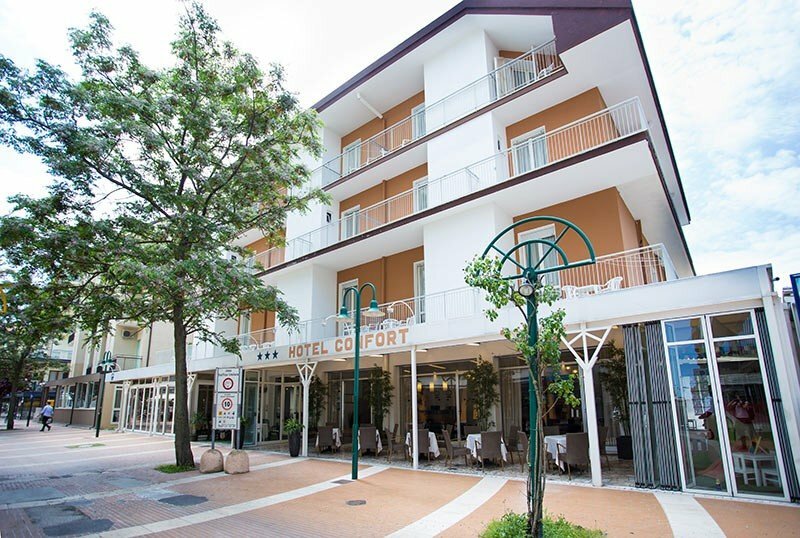 The Hotel Confort , 3 stars of Cattolica near the sea, parking, bicycles available and WI-FI connection throughout the structure. Accept small animals. It is located on the pedestrian promenade of Via Dante, near the sea: the beach can be reached in a couple of minutes on foot. Convenient to visit the Aquarium of Cattolica, less than 10 minutes on foot. The rooms have satellite TV and digital terrestrial, safe, telephone, WI-FI connection, independent air conditioning, ceiling fan and private bathroom with shower and hairdryer, complimentary toiletries. STANDARD : comfortable and elegant with basic services. BEAUTY : larger and renovated bathroom, minibar. Bikes for free use, open-air porch overlooking Viale Dante with ping-pong and table football, bar with TV area, elevator, beach towel, self-service laundry, weekly welcome drink, theme nights. It is equipped for cyclists. PARKING : covered, available for all to 150 meters from the structure. CONVENTIONS : beach, amusement parks, discos, swimming pool and shuttle service. Possibility of organized excursions. BREAKFAST : international buffet breakfast with sweet and savory products including cold cuts, cheese, yogurt, eggs, biscuits. 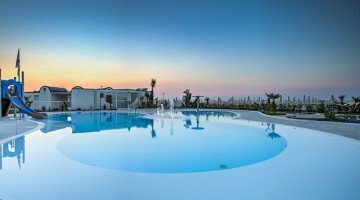 In hotel : children's pool at Hotel Antares (50m), indoor playground area, table tennis, table football, strollers, entertainment during the summer, baby / mini club, pediatrician. At meals : baby food , baby menu, kitchenette for families, possibility to eat with the nanny. On the beach : playground area, entertainment and mini club. The hotel has an agreement with the Zona 99 beach equipped with swimming pool, children's playground area, sports fields (bocce, beach tennis, beach soccer, beach volleyball), gym, fitness area, entertainment for adults, WI-FI connection, games deposit , baby point, bar. Prices are per person per day and vary depending on the period and availability of rooms. TOURIST TAX: excluded. € 1.00 per person per day for a maximum of 7 consecutive nights, excluding children under 14 years. For the bridges we will already be open, and will be the first opportunity to spend a pleasant weekend at the beach with your family at sea with sharks, flowers and wraps! On 1 May, our city will be beautified thanks to the famous "Flower Festival", the whole center will be embellished with flowers! Atmosphere Cattolichina, beauty room, fish every day, children's mini-pool heated to 50mt.dall'hotel! Full board packages and drinks with meals. Contact us, we do not need the deposit! What's better than starting the summer with a little holiday? Spend a beach holiday with your family: sand castles, drawing competitions and lots of entertainment will be the background to your well-deserved relaxation! Atmosphere Cattolichina and Romagnola cuisine, Mini club in hotel and beach, panoramic swimming pool on the beach! All inclusive packages! The father and the mother will be obliged to dance with their children during the theme nights! Contact us and book without deposit. Finally on holiday in Cattolica! Hotel Confort a few steps from the Beach, Catholic atmosphere, Fish specialties, heated whirlpool only 50 meters from the hotel, rooms with Wi-Fi. Also special packages 2/3 days in All inclusive (Full Board - Drinks at meals - Beach Service) And if you can do more days: super discounts! Contact us and book without deposit!